When teams come together they have two problems to solve. First, they need to figure out what work they need to do and then they need to learn how to work productively together. 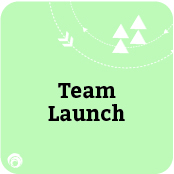 Team Launch is designed for newly forming teams to help them set off on the right track. Team Launch introduces team members to the internationally acclaimed FourSight Thinking System™ and uses the FourSight Your Thinking Profile Assessment as the basis to create Your Team Report. Team members learn how individual thinking preferences to clarify, generate, develop and implement ideas relate to the team’s capacity to solve problems, collaborate, communicate and innovate – essential factors in being able to get the job done well. With this new understanding of how to leverage a diversity of thinking preferences when approaching work challenges, teams come away with a common, intuitive language that bolsters collaboration, communication and productivity. This workshop can be conducted as a standalone session or as part of a full day facilitated session to address additional team needs such as norms for behaviour, roles and responsibilities. Discover your individual thinking preferences: Are you a clarifier, ideator, developer or implementer? Understand what this means to how you innovate, collaborate and communicate. Leverage your team’s diversity of thinking preferences when approaching work challenges. Use personal awareness and process awareness to build more effective teams. Learn a common, intuitive language and a process, which together bolster collaboration, communication and productivity. Run more productive and effective meetings.